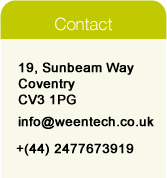 At WEENTech we always welcome passionate and talented professionals. WEENTECH provides excellent working environment full of learning opportunities to professionals interested in working in the field of clean energy innovations. We together can change great ideas to real life innovation and help creating a sustainable future. People with proven track record in areas such as green building design, energy efficiency, built environment and clean energy technologies are most welcome to contact us. If you wish to be a part of our team, write to us at [email protected]weentech.co.uk and remember to attach your CV and letter of motivation. Voluntary: opportunity for organising Global conference on energy and sustainable development February, 2015, Coventry University, technology Park, Coventry. Shortlisted candidate will be contacted. Free conference proceedings, lunch and local travel reimbursement will be provided.